Homeschooling a high schooler is a little bit different than homeschooling a younger kiddo. Well, actually it’s a lot different! It’s a whole different level of paperwork and records and planning for the future. And since my first is my only one in high school, I always wonder if I’m doing things correctly. Learning from another mom who has been there is always encouraging. That’s why I was so excited to review fTranscripts Made Easy: The Homeschooler’s Guide to High-School Paperwork from Everyday Education. I received a digital PDF copy of this book. It contains 138 pages of helpful tips and encouraging insight for parents homeschooling high schoolers. After reading it, I feel much better prepared for the paperwork side of things when it comes to homeschooling my kids all the way through high school. There were samples, personal anecdotes, and information on preparing for life after high school throughout this easy to read book. This product was mainly for me. It helped reaffirm that I was doing things correctly when it comes to our high schooler, and gave me some action steps to work on. Despite my formal teaching training, I still sometimes worry that I’m going to really mess things up for my kids! I think this is a natural struggle that many homeschooling parents deal with. So, having a well produced resource to turn to can help us overcome that fear when it pops up. I appreciate the emphasis the author put on learning instead of paperwork. The paperwork can be handled with a little bit of intention at the beginning of each semester. And if you get behind, you can get caught up with a bit of time. I also had my daughter read two chapters. One was on things you can do to prepare for a successful first year at college. The other was on college alternatives. Both of these offered great starting points for meaningful discussion about important topics. I was able to share some stories from my years at college, and what I wished I had done differently. She was able to ask questions about how to know if college is the right option, and we were able to talk about avoiding student loan debt – something that she sees me still trying to pay off. 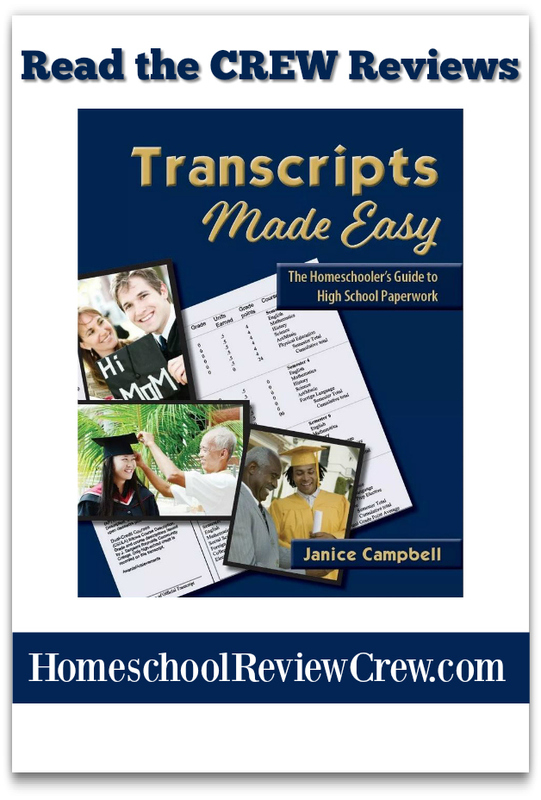 There is a lot to like with Transcripts Made Easy: The Homeschooler’s Guide to High-School Paperwork. I really learned a lot that will help me deal with the paperwork for my oldest now, but will also help me be better prepared for my younger kids when they reach high school age. I’ve never had to submit an offical transcript before or issue a diploma, and I really appreciated the author’s step-by-step directions on these tasks. The examples of both were very helpful. I reviewed the fourth edition of this book. This shows me that the author is concerned about keeping her book up to date and ensuring it is a valuable resource for parents. The chapter on preparing for the first year at college is new to this edition. It was written by an expert in the field. That was a nice addition. I think this book is a valuable resource for anyone homeschooling a high-schooler. I was one of 50 reviewers for this product. To see what the others thought, please click the banner below.